Monday, as was expected, the United Kingdom approved the creation of human-animal hybrids for research. British officials have bought it hook line and sinker . . . they want to maintain their reputation as leaders in stem cell research. 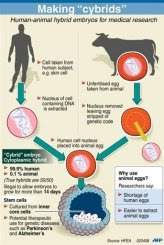 And since a strong contingent of organized groups have been successful at slowing down the human egg trade, creating a shortage of human eggs for research, the researchers are moving forward using enucleated animal eggs and adding in human genetic material, typically from a skin cell. Add a small jolt of electricity and Voila! The cybrid is here. Interspecies cloning has occurred. The bill also backs the creation of “savior siblings”. This means, if you have a sick child who needs a genetic match, you can make embryos in the lab through IVF technology, test them to identify the match, and then implant that embryo in order to save your sick child. Of course, this also means, generally the other embryos are either discarded or donated for research. Perhaps some of you have read Jodi Picoult’s book, My Sister’s Keeper? Chilling what happens when we treat people as means to an end. And no new law would be complete without either a Hollywood celebrity with an illness or a politician with a sick child or relative beating the desperate drum of Cures, Cures, Cures. May cool heads prevail as it looks as if we will stop at nothing?